I have just arrived back after spending the weekend in Amsterdam thanks to the project #ParkinnExpress. It was my first time exploring the city and absolutely loved it. We were given six clues for the trip, the idea was that Saturday would work a little bit like a scavenger hunt. The first task would be finding my fellow blogger for the weekend. Planning had been minimal and to compensate for this, I purchased a guide book in the airport and sat about reading it for the VERY short plane journey. Did you know that the flight from Gatwick to Amsterdam is shorter than the flight from Gatwick to Glasgow?! 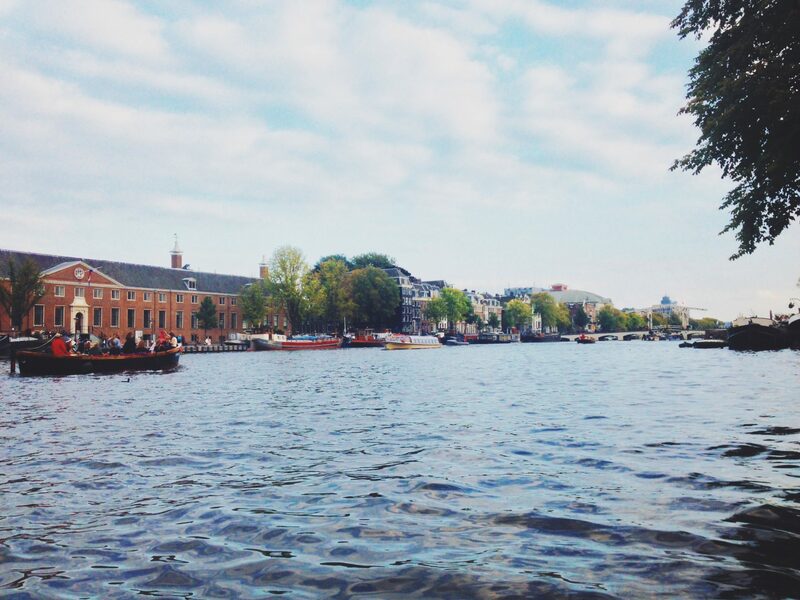 Amsterdam is a perfect place for a little weekend away from London. After my feet were safely on Netherlands soil, the fun began – firstly I navigated my way to central station. I then had some free time before fellow blogger Laura arrived so I had a quick wander about the city. The time came to meet Laura and I looked at my phone to find I had no signal (really uncool Three, I will certainly be getting this issue resolved ASAP). Laura had my phone number, how would I know how to find her, frantically I searched for some wifi and tweeted her my outfit and location. Typically it wasn’t easy finding each other and we ended up meeting at our first stop, which was the next clue. The Mac Bike store was where we would hire our transport for the day, signing up for bikes we quizzed the staff on where a market named after a famous person was. Turns out only one market is named after a person and the answer was easy. Set up with our cool red bikes, or in my case kids bike, we were given a lock demonstration and then set off for the market. Map in hand as we rode, navigating to the market was easy. Knowing which side of the road I needed to be on was not – the Dutch drive on the opposite side to us and I was highly confused. We safely made it to the market and locked up our bikes with what seemed like the rest of the city’s bikes! The market felt very ‘working class’ and not touristy at all, I loved wandering through. There was no one to pester you like I had experience in Asian markets and so much on offer throughout each stall. Then it was on to the next part of the clue: find a place you can ‘TRUST’ for lunch, you’ll only have to pay what you think. The clue seemed obvious, we were looking for a cafe called Trust but as we moved along the market I was beginning to doubt our detective skills – it didn’t help the market was hiding half of the stores behind. 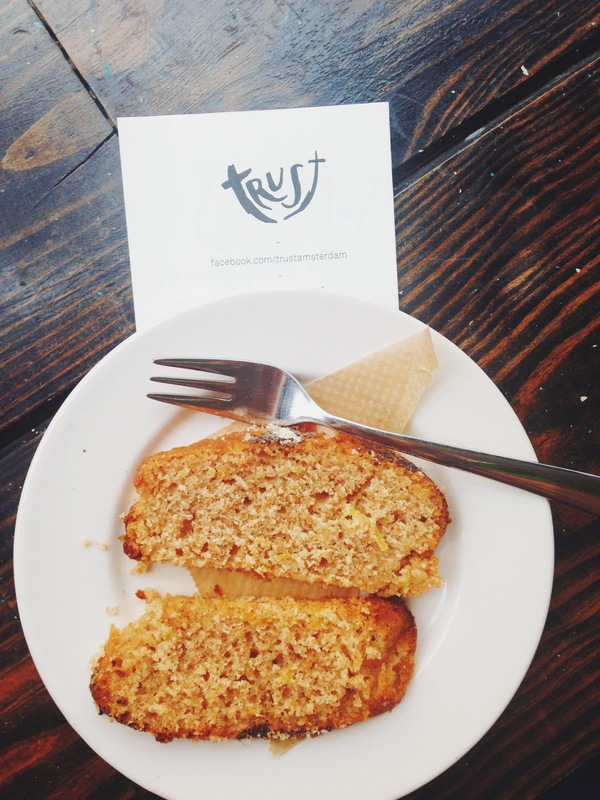 Then suddenly I spotted it, a cafe called Trust where you only pay what you think your meal is worth. 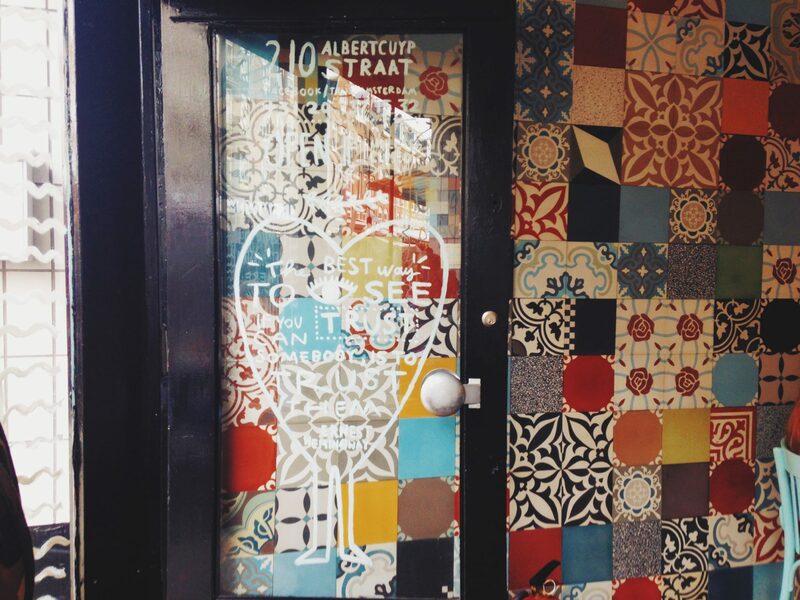 I won’t go in to too much detail as I loved the cafe so much I have a whole post I want to dedicate to it. However I will say the place is run by volunteers, the decor is funky and the food yummy although slightly small in portion size. It reminded me of a cafe you would expect to find in Melbourne, I felt very at home. For the next clue we were in search of an art gallery with the painting pictured (on our clue) inside. I had stumbled across the answer a few hours earlier in my guide book and it didn’t take us long to get there. Beyond anything the Rijksmuseum was gorgeous – inside and out had amazing architecture. We quickly locked up the bikes, took the obligatory photo of the I AMsterdam sign before wandering inside. Our clue had told us to take a tour but unfortunately we arrived a little too late as the last tour had already started. In favour of enjoying the beautiful weather outside we decided to wander the gardens – after all time was against us and we still had a few more clues to get through. Leaving the museum behind and our bikes locked up safely we headed for number 78 of stadhouderskade. The clue talked about transport but the number lead us to the Heineken Experience – unsure if the clue wanted us to take a boat from here or do the Heineken experience and it’s boat. We pondered our options but eventually realised that whichever we were meant to do, we didn’t have time for anyway – the bikes had to be back by 5.30pm. We needed a new game plan, currently we were miles away from the bike shop. Deciding it was best to get rid of the bikes first we found our two wheels of joy and cycled on. With no focused route back we took roads as we fancied and ended up in a little bit of a lost mess. Eventually we worked out where we were and got back to the bike shop in no time. With the bikes returned we choose to still ‘relax and navigate the city’ just taking the boat from a more suitable location. Each boat trip seemed to be very similar, an hour cruise around the canals taking in many of the sights and an explanation of each along the way. We queued for a while to get on the boat but I was glad we stuck the queue out. The boat trip was relaxing and informative, it really gave you a different perspective of the city than whizzing through on the bikes. The waterways were packed with other tourist boats but also plenty of locals whose saturday nights party seemed to be on a boat with plenty of friends enjoying food and drink. Finally we were on to the last clue, take the train back to the airport and then find the orange shuttle – this is where we would find the hotel. The journey didn’t take long at all and within no time we were checking in to our hotel rooms at the Park Inn. 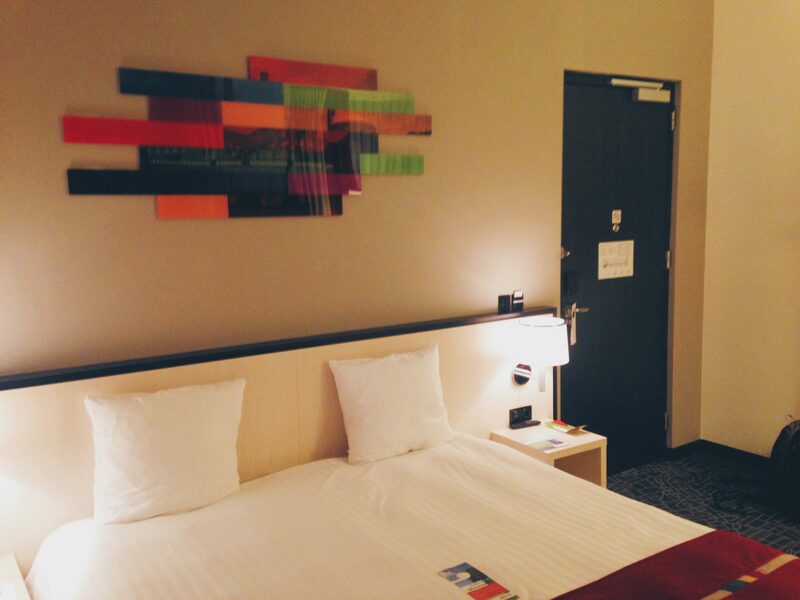 The hotel was lovely; bright and modern decor injected with lots of colour. There was plenty of space to relax downstairs either in the bar or lobby area. The rooms were large with a huge bed and shower, plenty of windows lighting up the room and a desk space to work at. The hotel was a perfect rest place away from the city and all of its craziness. 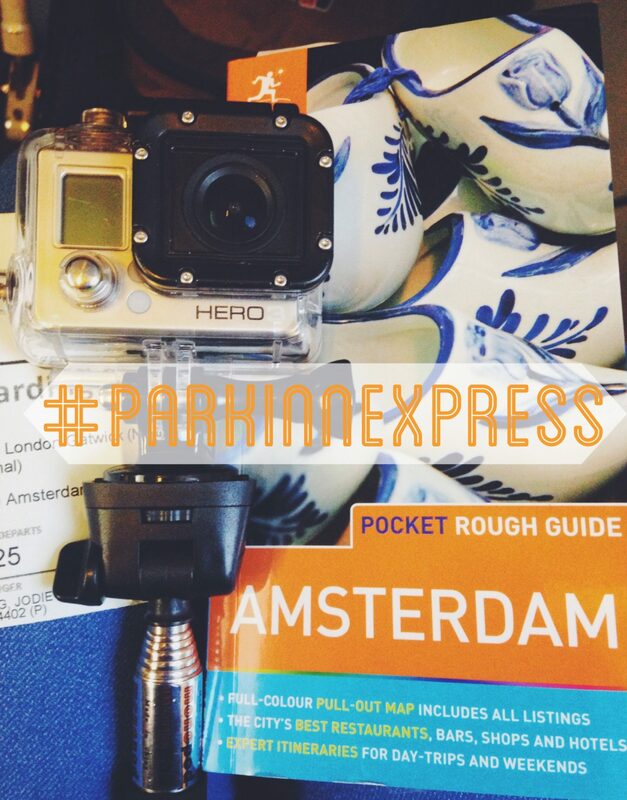 I had a great time on my Amsterdam Adventure with fellow blogger Laura and the #ParkinnExpress campaign. A big thank you to them for flying me to Amsterdam for the weekend and supplying my accommodation for the night. It seems to be a very nice trip !!! I’m sure you had a great time in Amsterdam, with Laura who is such a nice girl.